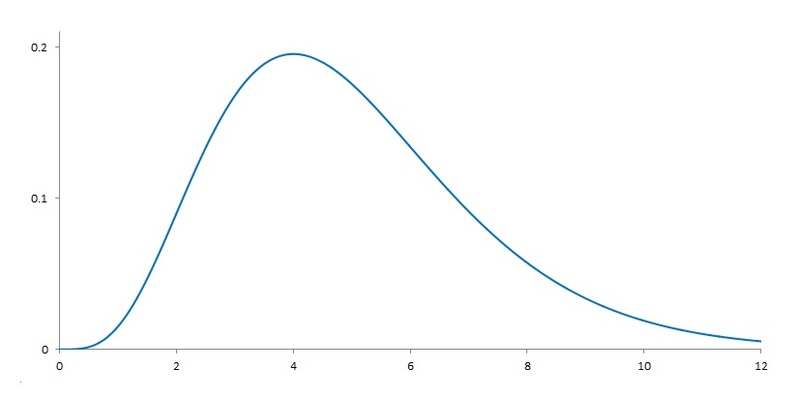 This post highlights certain basic probability problems that are quite easy to do using the concept of Markov chains. Some of these problems are easy to state but may be calculation intensive (if not using Markov chains). But the solutions using Markov chains involve raising a matrix to a power or finding the inverse of a matrix. The concept of Markov chains is a good framework to organize these problems. Interestingly some of these problems are classic problems in probability (tossing coins, rolling dice, occupancy problem, coupon collector problem). 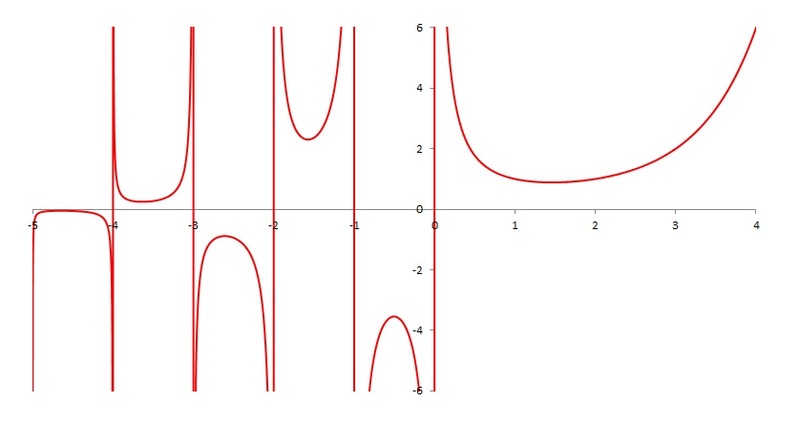 The problems listed here are to highlight the discussion in a companion blog on stochastic processes (links are given below in appropriate places). A fair coin is tossed repeatedly until the appearance of 4 consecutive heads. A fair die is rolled until each face has appeared at least once. What is the expected number of rolls to achieve this? Balls are thrown into 6 cells (one ball at a time) until all 6 cells are occupied. On average, how many balls have to be thrown until all 6 cells are occupied? Balls are thrown into 6 cells (one ball at a time). After throwing 8 balls into 6 cells, what is the probability that exactly of the 6 cells are occupied where ? Consider the maze that is described in Problem 6. Assuming that the mouse is initially placed in Area 1, what is the expected number of moves in order for the mouse to find food? Consider the maze that is described in Problem 6. 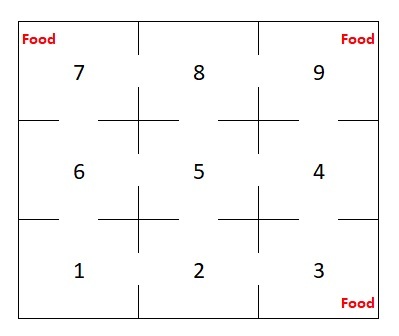 Assuming that the mouse is initially placed in Area 1, what is the probability that the first area of food reached by the mouse is Area 9? Problem 1 and Problem 2 has a natural interpretation as a Markov chain. In this case the chain consists of 5 states – 0, H, HH, HHH, HHHH. As the coin is tossed repeatedly, the chain moves through these 5 states. 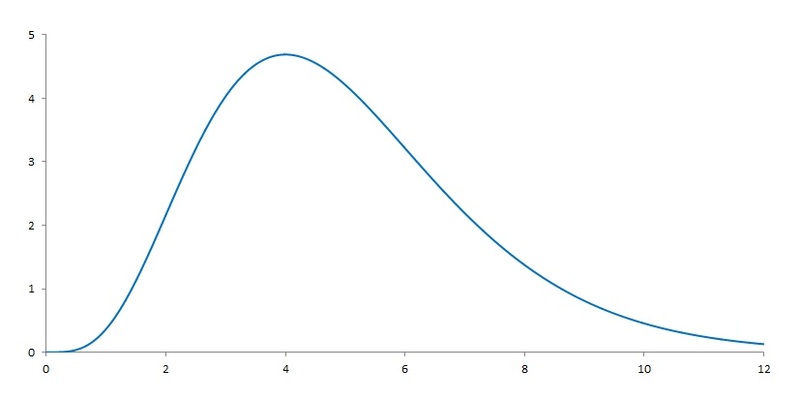 One characteristic of a Markov chain is that the probability of moving from one state to the next depends the current state (the last state visited) but not on the states prior to the current state, i.e. it only remembers the last state and not the states before the last state. Before any toss is made, the state is 0. Suppose the first toss is Head. The second toss could be Head (the Markov chain then moves to state HH) or could be Tail (the chain then moves to state 0). Suppose the second toss turns out to be a Tail. Then the next toss could be a Head (the chain then moves to the state H) or could be a Tail (the chain continues to stay at state 0). A good framework is to describe such movements in a matrix called transition probability matrix. To answer Problem 2, just raise this matrix to the 9th power (see here). Problem 1 is more involved (see Example 2 in this post). The listed problems are based on discussion in three different posts. Here’s the links. 4 Problem 4 is identical to Problem 3. The setting of Problem 4 is an occupancy problem. 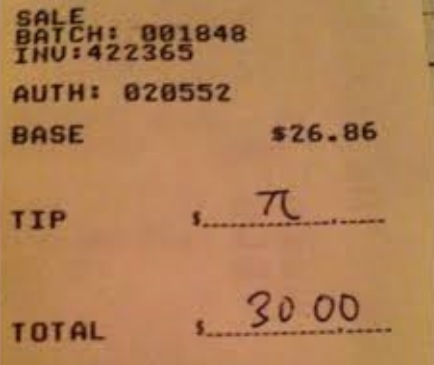 It can also be solved as a coupon collector problem. Another advantage of using Markov chains for these problems is that the method scales up quite easily. For example, for the occupancy problem (Problems 3, 4 and 5), if the number of cells is higher than 6, it is quite easy and natural to scale up the transition probability matrix to include additional states. Then proceed with the same method. There is a learning curve at first. 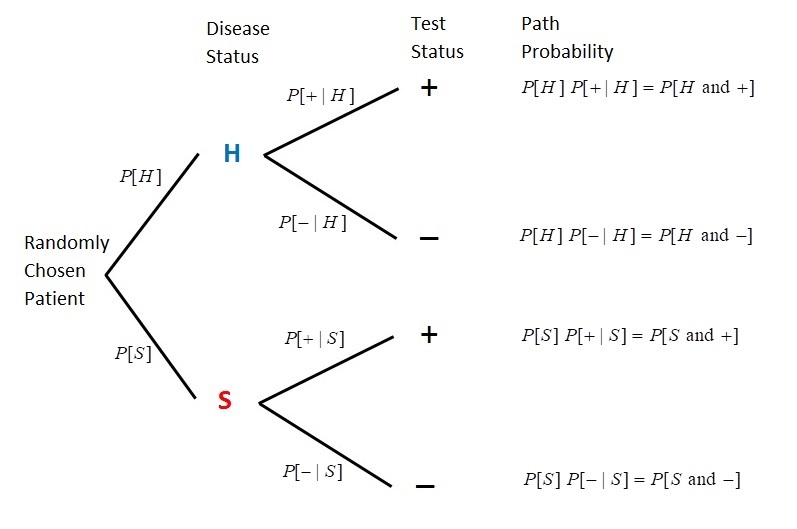 But once the concept of Markov chains is understood, the probability problems described here or other similar problems can be tackled quite easily and routinely. For a basic discussion of Markov chains, see the early posts in this companion blog. The previous post is on the Monty Hall Problem. This post adds to the discussion by looking at three pieces from New York Times. Anyone who is not familiar with the problem should read the previous post or other online resources of the problem. The first piece describes a visit by John Tierney at the home of Monty Hall, who was the host of the game show Let’s Make a Deal, the show on which the Monty Hall Problem was loosely based. The visit took place in Beverly Hills back in 1991, one year after the firestorm caused by the publication of Monty Hall Problem by Marilyn vos Savant in Parade Magazine. The purpose of the visit is to obtain more confirmation that the counter intuitive answer (switching door) is correct and to get more insight about the game from Monty Hall himself. Before discussing the visit, here’s the statement of Monty Hall Problem. The previous post actually uses five pictures to describe the problem. In front of Tierney, Monty Hall performed a simulation in his dining room. Monty Hall put three miniature cardboard doors on a table and represented the car with an ignition key. The goats were played by a package of raisins and a roll of Life Savers. Monty Hall conducted 10 rounds of the game as the contestant (John Tierney) tried the non-switching strategy. The result was that the contestant won four cars and six goats. Then in the next 10 rounds, the contestant tried switching doors. The result was markedly different – the contestant won eight cars and two goats. The simulation gives strong indication that it is more advantageous to switch door. The standard solution: with the switching door strategy, the contestant wins the car 2/3 of the time. On the other hand, the contestant only wins the car 1/3 of the time if he/she stick with the original pick. It turns out that the optimal solution of switching door should come with a caveat, which is given in the previous post. The caveat is that the strategy of switching door works only if the moves of the game are determined by random chance – the contestant picks a door at random, then the host picks a door at random (if the contestant’s pick happens to be the winning door). 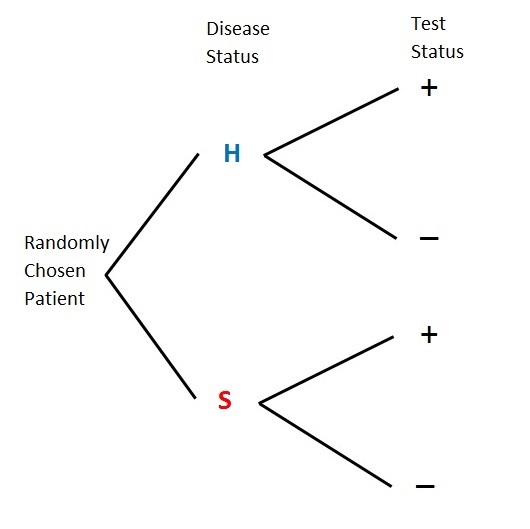 After the choices are made at random, the host will be required to offer the chance to switch. Once all these conditions are met, the switching door strategy will be optimal. The description in the preceding paragraph works like a computer program, in which all the rules are clear cut. There is no psychological factor involved. But Monty Hall did not run his show like a computer program. He sometimes did things that are meant to trick the contestants. Month Hall did not always followed the standard assumptions. According to the NY Times piece, sometimes Monty Hall simply opened the contestant’s original pick (if it is a goat). So the picking a door showing a goat routine did not have to be done. Sometimes, he conned the contestant into switching door (if the contestant’s original door is a car), in which case, the switching strategy would have a zero chance of winning. So there is psychological factor to consider in the actual Monty Hall game. The host may try to trick you into making a wrong move. So the actual way in which the game is played may render the “academic” solution of the Monty Hall problem useless or meaningless. In any case, whenever the standard solution of Monty Hall Problem is given, the caveat should also be given. Indeed, if the game is played according to a random chances and if the contestant always switches door, then the company that hosts the game would lose too many cars! For financial reasons, they cannot run the show like clock work. The second piece from NY Times is on the cognitive dissonance that some people experienced with the Monty Hall problem. The third piece is a more recent discussion and is concerned with variations of the standard Monty Hall Problem. This piece consider tweaks to the basic game in two ways. The question: does each way of tweaking reduce the probability of the host losing a car? Or what is the probability of the host losing a car? Here’s the two tweaks. First challenge: Suppose Monty Hall’s game show is losing money, and they want to tweak the game so they don’t lose the car as frequently. They announce to the audience that once you choose the door, the host will flip a fair coin to decide which of the other doors will be opened. If the car is behind the door that they open, you lose. If it is not behind the door that they open, you get to choose whether to stick with your door or to change to the other closed door. What do you do if that happens? And now, going into the game, assuming that the contestant behaves optimally, what is the probability that the game show will lose the car? Second challenge: Now suppose that the game show gets even greedier, and secretly tweaks the game even more. But news of their tweaking is leaked, and the contestants find out that the host is actually using a weighted coin when they are determining which other door will be opened, and the coin is weighted such that the door with the car behind it will be opened by the host with ¾ probability. (When the car is behind the door that you choose initially, the host uses a fair coin to determine which of the other doors to open.) Now, if the door that they open doesn’t have the car behind it – should you stick with your original choice or should you switch? And, assuming that the contestant behaves optimally, did the nefarious game show succeed in reducing the probability that they lose the car? In each tweak, the problem assumes that the contestant behaves optimally in the game. I suppose that means the contestant always switches door if the switching is possible. An even more interesting exercise would be to calculate the probability under the switching scenario and under the sticking scenario. The post discusses the Monty Hall problem, a brain teaser and a classic problem in probability. The following 5 pictures describe the problem. Several simple solutions are presented. Assuming that you, the contestant in the show, wants to win a car and not a goat, which door should you pick? Should you stick with your original pick of Door 1, or should you switch to Door 2? It is clear that had the game show host not intervened by opening another door, your chance of winning a car would be 1/3. Now that one door had been eliminated, you are faced with two doors, one being your original pick and another door. Would choosing one door out of two means your chance of winning the car is now 1/2? If this were the case, it would mean it does not matter whether you switch your choice or not. Enough people were reasoning in this same way that this problem stirred up a huge controversy back in 1990 when the problem was posed on Parade Magazine. More about that later. For now, let’s focus on the solution. It is to your advantage to switch your choice. With switching, the probability of winning the car is 2/3, while the winning probability is 1/3 if you stick with the original choice. The rest of the post attempts to convince doubters that this is correct. 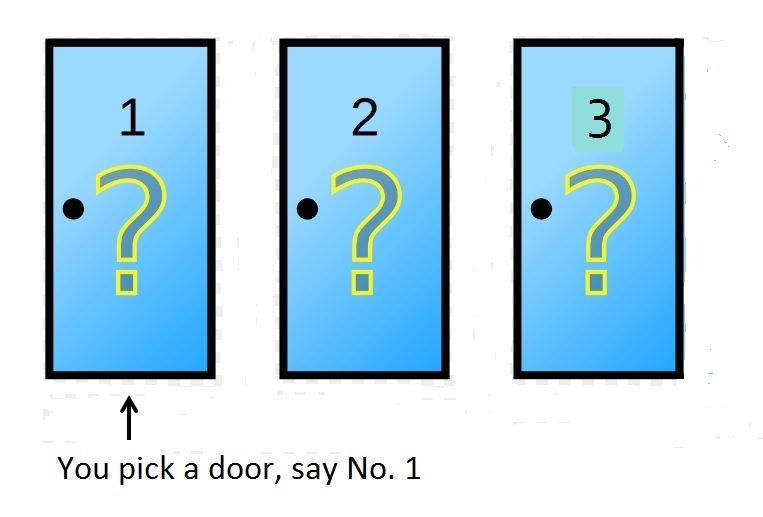 The problem described by the 5 pictures above is based on the assumption that the contestant picks Door 1 and the host picks Door 3. The problem in the pictures is asking for the conditional probability of winning by switching given that the contestant picks Door 1 and the host picks Door 3. We solve a slightly different problem: what is the probability of winning a car if the contestant uses the “switch” strategy, which is the strategy of choosing the alternative door offered by the game show host. At the end, the first problem is also discussed. The game involves selections of doors by the contestant and the host as well as by the staff who puts the prizes behind the three doors. It is important to point out that the manner in which the doors are chosen is important. Basically the doors have to be selected at random. For example, the staff of the game show selects the door with the car at random, the contestant selects his/her door at random, and the game show host select his/her door at random (in case that the door with car and the contestant’s door are the same). Under these assumptions, the best strategy is to switch. If the doors are not selected at random, the solution may not be the “switch” strategy. An effective way to demonstrate that switching door is the optimal solution is through playing the game repeatedly. Let’s use a die to simulate 20 plays of the game. The simulation is done in 4 steps. In Steps 1 and 2, roll a fair die to select a door at random. If it turns up 1 or 2, then it is considered Door 1. If it turns up 3 or 4, then Door 2. If it turns up 5 or 6, then Door 3. In Step 3, the host also rolls a die to select a door if the door with car happens to be the same as the contestant’s choice. In Step 1, the rolling of the die is to determine the prize (i.e. which door has the car). In Step 2, the rolling of the die is to determine the choice of door of the contestant. In Step 3, the host chooses a door based on Step 1 and Step 2. If the door with the car and the door chosen by the contestant are different, the host has only one choice. If the door with the car and the contestant’s door are identical, then the host will roll a die to choose a door. 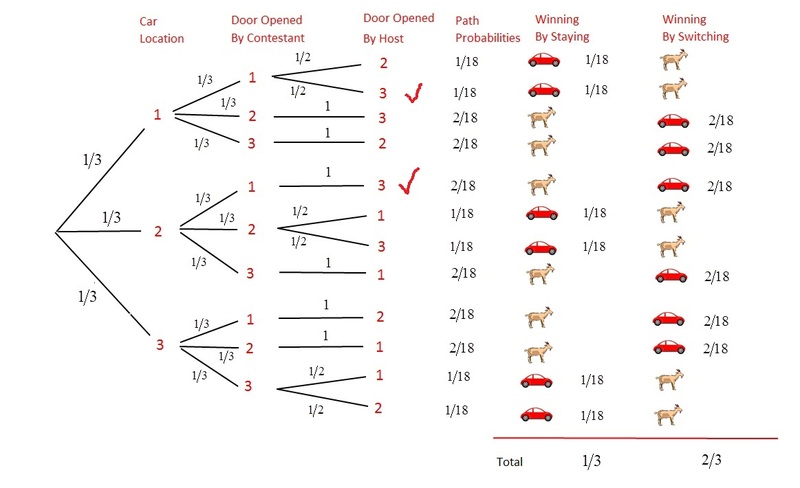 For example, if Door 1 is the door with the car and the door chosen by the contestant, then the host chooses Door 2 and Door 3 with equal probability (e.g. if the roll of the die is 1, 2 or 3, then choose Door 2, otherwise choose Door 3). In each of the 10 simulations, the chance of winning a car is between 66% and 67% (by switching). In all of the 100,000 simulated games, the chance for winning a car by switching door is 66.782%. More and more simulations showing essentially the same results should give us confidence that the “switch” strategy increases the chance of winning and that the probability of winning is around 2/3. If anyone who still thinks that switching does not make a difference, perform simulations of your own. It can be done by rolling a die as done here or by using computer generated random numbers. In fact, a computer simulation can produce tens of thousands or more plays. But anyone who does not trust computer simulations can simply generate 100 games by rolling the die. Simulations, when done according to the assumptions behind the game (the assumptions that the doors are selected at random), do not lie. 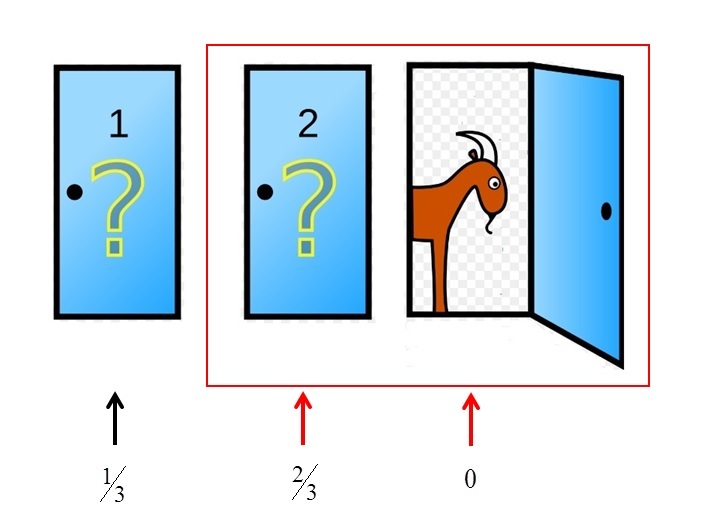 In fact, many of the skeptics in the Monty Hall problem were convinced by simulations. Note that in Step 4 of the simulation, one pattern is clear about switching to the door offered by the host. The contestant will win a goat if his/her original choice of door happens to be the same as the door with the car. On the other hand, the contestant will win a car if his/her original choice happens to be different from the winning door. The observation is actually another explanation of the solution. Let’s say the contestant picks Door 1 originally. There are three cases to consider since the winning door can be any one of the three door. Let’s look at what happens if the contestant switches door in each case. The contestant wins 2 of the three cases by switching door. The contestant wins in only one of the cases if he/she were to stick with the original choice of door. The three cases are equally likely since the winning door is supposed to be randomly selected. So in the “switch” strategy, the probability of winning a car is 2/3. The solution in the previous section is a simple but correct solution. For anyone who thinks the solution is too simple, the following two diagrams can supplement the reasoning in the above simple solution. In Figure 6, assume that the contestant picks Door 1, which as a 1/3 chance of winning a car. Then the other two doors as a group has a 2/3 chance of winning the car. 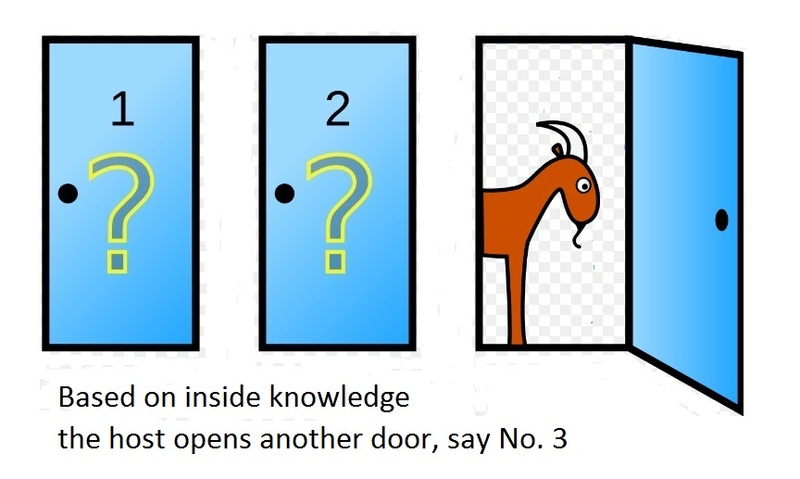 In Figure 7, the game show host opens a door with a goat (Door 3). The two doors of Door 2 and Door 3 as a group still has a 2/3 chance of winning a car. Since Door 3 is eliminated by the host, Door 3 now has zero chance of winning a car. So Door 2 has a 2/3 probability of winning the car. It is then advantageous for the contestant to switch door. 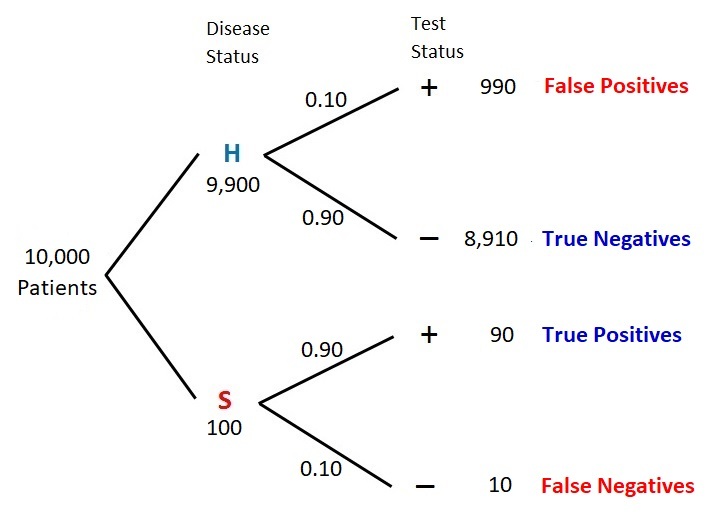 Another way to view the problem is through a tree diagram. The idea is that such a tree diagram would capture the idea that the game show takes places in stages, e.g. the car is randomly placed behind one door, the contestant randomly picks one door, the host picks a door (randomly if required). The following diagram captures the entire random process. Because the door is chosen at random, the probability at a branch is 1/3 if there are three branches at a decision point and the probability is 1/2 if there are two branches at any given node. Of course, if there is only one choice of a door, then the probability at the point is 1. 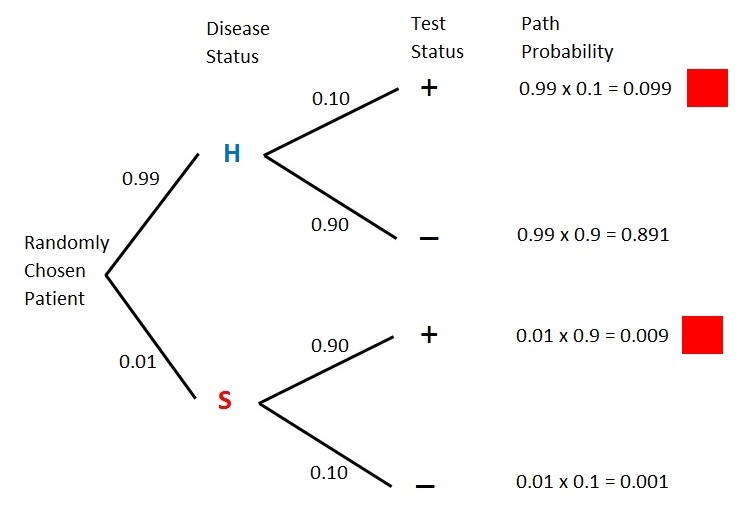 There are 12 paths in the tree and each path probability is the product of all the individual probabilities in that path. At the right of the diagram, we compare the stay strategy and the switch strategy. With the stay strategy, the contestant wins in 6 of the paths. If using the switch strategy, the contestant wins in the other 6 paths. But the 6 paths with the switch strategy are twice as likely to happen. The several solutions so far solve a general problem – if the contestant picks the door offered by the game show host, what is the probability of winning a car? 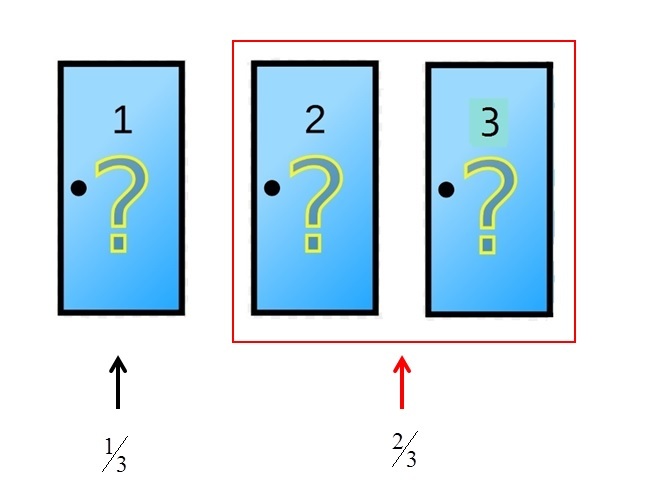 In the pictures, the problem is: if the contestant picks Door 1 and the host picks Door 3, what is the winning probability for the contestant under the switch strategy? This is a conditional probability. Figure 8 has all the ingredients for the answer to this problem. In Figure 8, there are two paths in which the contestant picks Door 1 and the host picks Door 3. The following diagram shows these two paths with a check mark. For one of these two paths, the car is behind Door 1 and for the other path, it is behind Door 2. The path with the car behind Door 2 is twice as likely as the one with the car behind Door 1. With the switching strategy, the path with the car behind Door 1 would lead to a goat (losing path) and the path with car behind Door 2 will lead to a car (winning path). The winning path is twice as likely. Thus the winning probability for the switch strategy is 2/3 if the contestant picks Door 1 and the host picks Door 3. Now this answer is the same as the answer for the general problem discussed previously. However, the conditional problem is a different problem. The Monty Hall problem is loosely based on a real game show called Let’s Make a Deal. At one point in time, it was only a brain teaser as well as an academic problem (being discussed in statistics journals). In 1990, it appeared in a column by Marilyn vos Savant in Parade Magazine. In that column, vos Savant used the simple 3-case solution above to explain that the contestant should switch. The problem generated so many responses from angry readers, some of them had PhDs in math or statistics. Because of the ensuing controversy, the Monty Hall problem became a famous problem the world over. It is covered in many standard probability and statistics books and courses. Eventually some of those angry readers came to understand that the correct answer is the switch strategy. In fact, Paul Erdős, a famous and prolific mathematician in the 20th century, did not believe that switching is the correct answer. He remained unconvinced until someone showed him a computer simulation (see here). Some psychologists asserted that the Monty Hall problem causes cognitive dissonance. As a result, the problem is confusing and even troubling to some people. See this article for the discussion. The Monty Hall problem is all over the Internet. The Wikipedia entry on Monty Hall problem has more detailed information mathematically and in many other aspects. This article from Scientific American is also interesting.